On Friday, December 4th, a team of Kirkland & Ellis volunteers spent the afternoon coaching 90 second to fourth grade students from Urban Initiatives’ Work to Play program. The volunteers led small teams of students from Jordan Elementary (Rogers Park), Faraday Elementary (East Garfield Park), and Bateman Elementary (Irving Park) through friendly soccer games against each other. 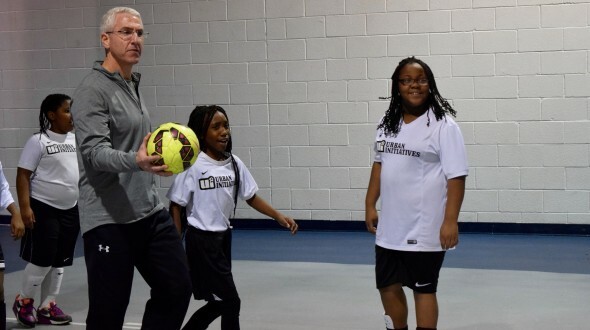 After eleven weeks of working together at practices and during games against other schools, the Urban Initiatives players were more than ready to show off their best soccer skills and teamwork. Their shots were on target all afternoon; they worked together to defend their goals; and they pulled out their best moves with rollbacks and Messi’s in abundance. The Kirkland & Ellis coaches offered advice about technique and sportsmanship from the sidelines and helped keep their teams feeling energized and excited all afternoon.